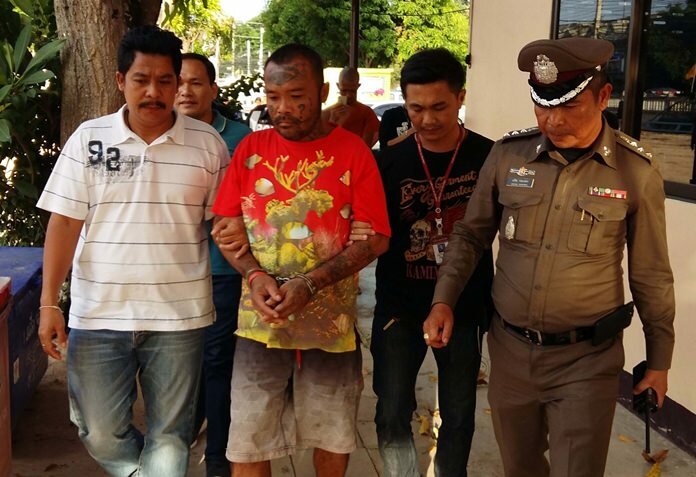 Itthiphol “Three Eyes” Sai-en was arrested in Bang Saray for the bludgeoning death of Klisana Merakul. A drinking buddy has been arrested for allegedly killing a former monk near Boon­kanchanaram Temple’s crematorium last month. Itthiphol “Three Eyes” Sai-en, 39, was captured hiding at a friend’s house in Bang Saray June 9 for the bludgeoning death of Klisana Merakul, 40. Kilsana’s remains were discovered May 30 in a room adjacent to the crematorium. His body was covered with a cloth and his head was crushed. Near the corpse police recovered a hammer believed to be the murder weapon. Itthiphol turned out to be not all that difficult to locate. Witnesses described a man seen near the murder scene who had third eye tattooed on his forehead. Once the description was published on social media, tips poured in about the boatman. Police said Itthiphol confessed that he killed his friend in an argument that broke out after the two got drunk on cheap whisky in the shack near the crematorium.